Films I Watched When I Was Younger – Issue 2: Speed – James Proclaims! 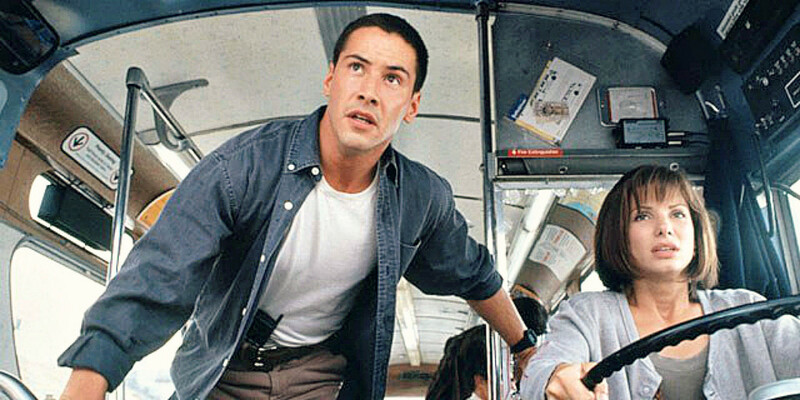 1994’s Speed is often referred to as Die Hard on a Bus. Which is a little unfair. While many action flicks owe much to the mighty Die Hard I’m not sure Speed really does. Unlike John McClane, Speed’s protagonist, Jack Traven (Keanu Reeves), spends very little of the movie fighting and killing bad guys. Indeed he only dispatches one bad guy. Because there is only the one. And (this is hopefully not too much of a spoiler, although if it is then you really only have yourself to blame – you have had well over twenty years to watch the thing) he doesn’t see off that bad guy until the end of the film. Instead, Traven spends most of the running time trying to foil the evil machinations of the aforementioned bad guy, machinations which mostly consist of trying to blow things up, mainly a bus, but also an elevator and an underground train. Which isn’t to say there isn’t a lot of action, it’s just more ‘a bus travelling at high speed through places where it shouldn’t be travelling at high speed’ action, rather than ‘lots of shooting of terrorists’ action. Directed by Jan de Bont (who went on to direct…er…nothing else good), Speed is aptly named. Admittedly the bus, which is the scene for much of the action, rarely travels much above 50mph, which is no doubt fast for a bus, particularly through heavy traffic, but not really all that fast in the greater scheme of things. The narrative, however, travels along at a breakneck pace. The bad guy in question is Howard Payne (played ably by Dennis Hopper) and he’s as mad as a box of frogs. But, as we’re reminded multiple times during the movie, crazy doesn’t mean stupid. Indeed he is very much one step ahead of the authorities and the intrigue comes in part from Traven’s efforts to match wits with Payne. Mostly, though, it comes from a bus going too quickly. Hopper and Reeves both perform admirably but arguably the standout performer is Sandra Bullock as Annie, the plucky student who ends up quite literally in the driving seat. This was very much a star-making turn for Bullock and deservedly so. The plot of Speed defies credibility at times (quite a lot of times actually) and the dialogue is as hackneyed and clichéd as many a bog-standard action flick but Speed is definitely a notch above others of the genre. The pace is relentless and there isn’t time to dwell on the bits that don’t make sense. Far better to suspend all disbelief and just enjoy the ride. Because it is indeed quite a ride. I love that line. Classic action hero quip, with subtle understated twist. I take it nobody is sat in the bus with their feet up on another seat, or spreading out to use two seats? Also I don’t suppose there are many youths crowded around the exit door, as they do in London. Still sounds a bit exciting. Yes, mad though it is with the Los Angeles setting, this film would be even more bonkers it was set in London. Here, Howard Payne falls for the ‘ol ‘ink-bomb-in-the-money-bag’ trick.